Jersey is actually home to some very good wines, but unfortunately doesn’t really enjoy that reputation among wine aficionados, at least as far as I can tell. 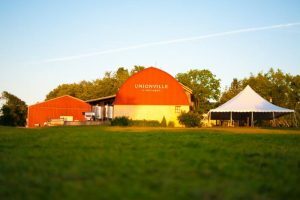 Having volunteered there in the past during crush, and knowing Unionville Vineyards’ winemaker Cam Stark, I went back this past Sunday to Ringoes, NJ to taste Unionville’s latest offerings, and I wasn’t disappointed. Cam wasn’t around, but we were greeted warmly and well taken care of by the tasting room staff. The place was pretty busy, which was nice to see, and when our host was suddenly overtaken by a flood of guests, General Manager John Cifelli kindly stepped in to pour for us. A $10 fee got us—and gets you—a very generous tasting of any 8 wines on Unionville’s expansive list of dry and off dry whites, an off-dry Rose, several dry reds and four dessert wines. Honestly I don’t know how Cam and his team can craft them all, and to be honest I think they’re stretching themselves pretty thin with a lineup larger than almost any other winery I know. One thing though: many of these wines are produced in quantities that are remarkably tiny and some are under 100 cases. So maybe Unionville is just a very large “garagiste” boutique winery in the end. Unionville operates as a collection of NJ vineyards—just farms, really—owned by a group of landowners who value the growing of wine grapes along with preserving the landscape. But Cam and his team handle every aspect of winemaking from vineyard to bottle. Along with typical offerings including some very good Chardonnays, a Pinot Grigio, Pinot Noir, and a Bordeaux blend, Unionville offers wines that are rarely grown on the East Coast, including a classic Rhone blend of Marsanne and Rousanne, and a Viognier. Remarkably, they also craft a Counoise varietal wine, one of the 13 red grapes that under French wine laws can go into a Chateauneuf du Pape, and one of only a few wineries in the USA that grow it. I honestly don’t remember the last time I tasted it, at Tablas Creek winery in Paso Robles. Amwell Ridge Vineyard Marsanne-Rousanne 2013: Really nice, medium body, classic zesty. Amwell Ridge Vineyard Viognier 2013: Wonderful nose and very nicely balanced, but didn’t have the typically apricot flavor. Home Vineyard Chardonnay 2013: Very nice, and a double-Gold award winner at the San Fran Chronicle Wine Competition. But it was bested by Unionville’s Pheasant Hill Chardonnay 2012, which was as good as many fine white Burgundies I’ve tasted.Cam Jam 2014: Light bodied and mostly Pinot Noir, with bright cherry fruit. Amwell Ridge Vineyard Counoise 2013: Very earthy yet appealing, and very hard to find anywhere. Peasant Hill Vineyard Syrah 2012: Thankfully lacked the viscous and cloying nature of a lot of Syrahs, and this one included a bit of Viognier—yes a white grape—which adds a lovely aroma and some grace notes. The Big O 2014: A really very, very nice Bordeaux style of Cab Sauvignon, Cab Franc and Merlot. previous post: What’s in a Wine Word?